Part of "Security Task Manager". RegistryBooster.exe Safe Part of "Uniblue Registry Booster". SpeedUpMyPC.exe Safe Part of "Uniblue SpeedUpMyPC3". SpyEraser.exe Safe SpyEraser is an Anti Spyware Tool. Firefox.exe Safe Firefox is an Internet Browser. taskmgr.exe Safe This is "Windows Task Manager". AWC.exe Safe Part of "Advanced Windows Care". realshed.exe Safe Part of "Real Player". avguard.exe Safe Is the Guard of Avira Anti Virus. spoolsv.exe Safe This is a Windows Process. Safe This is a Windows Process. Sup_SmartRAM.exe Safe Is the RAM Optimizer of Iobit. Pareto_AS.exe Safe ParetoLogic Anti Spyware Software. avgnt.exe Safe The main window of Avira Anti Virus. explorer.exe Safe This is a Windows Process. alg.exe Safe This is a Windows Process. Smc.exe Safe Part of "Sygate Personal Firewall". a2service.exe Safe Part of "a-squared Anti Malware". winlogon.exe Safe This is a Windows Process. 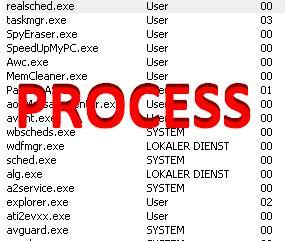 Lsass.exe (lsass.exe) Safe This is a Windows Process. isass.exe (Isass.exe) High (Dangerous) Worm Sasser is using a process called isass.exe, it looks like the safe lsass.exe, so watch out this process! M3SRCHMN.EXE High (Dangerous) This is a part of the MyWebSearch Spyware Toolbar! MWSOEMON.EXE High (Dangerous) This is a part of the MyWebSearch Spyware Toolbar! 444.471.exe High (Dangerous) Part of the MsSecurity Updated (MsSecurity1.209.4) Virus! mwssvc.exe High (Dangerous) This is a part of the MyWebSearch Spyware Toolbar! Heute waren schon 2 visitors (8 hits) hier!